So there's really only one thing left in our (seemingly) relentless review of this year's men's basketball season. We need to look at the players, and they do an Rx for what the team needs to do to compete next year. I'm always cautious about talking about players individually too much. I mean, their Mother could read this, and I don't want to be that blog, the one that is ripping some 20 year old who is doing all he can and then leaving those words on the Internet forever. I just tend to talk about the team--which is more interesting to me anyway--and talk players here and there. With that in mind, I wholeheartedly concur with the individual reviews done on Falcon Fodder, the blog on the Blade by John Wagner. If you read them, you can see how each player performed and how they need to improve in posts that are "Mother-safe." One thing really stands out for me when I read those profiles...the common thread is shooting. If you look back on the statistical reviews I did over the past couple of weeks, I think it is even clearer. This team has to score more efficiently, and the most important step to that is to shoot better. We play inside out, and we really need the OUT part of that equation to be functioning. If Calhoun can continue to grow as a player, he is going to draw coverage, and we need to do better hitting the open shots that will result. If they can be 3s, so much the better. Speaking of Calhoun...I believe the real key to this team for next year is for Cam Black to develop into the contributor he can be. We saw glimpses early, and then he didn't get as many minutes later, and there were some indications that he wasn't healthy (someone on AZZ.com said that his mother told them he grew 2 inches this year). That's all conjecture, except to say this. If Black can handle the 5, Calhoun is incredibly dangerous playing 4 in our league. He's less so against the 5s, but I think he's deadly at PF. To me, the single thing to help this team compete next year is for Black to become a really good player--which I think he can do. Here is what I think is important. There is an assumption that BG will be able to compete for a title next year simply because we were OK this year, and we only lose one regular, and he wasn't even starting for most of the year. I don't see it that way. Kent, who beat us twice, is only losing one regular, too, and yes, they need a new coach, but there are plenty of players coming back from an already good team. Akron loses three good players but has some good players back and adds at least one very interesting transfer to the mix. Miami loses Winbush and Ballard, but Mavunga is back...you get the point. This is a young league right now. Everybody is on the vector BG is on. The key for BG to compete next year is how much better players develop. You could argue that Dee Brown and Scott Thomas were better plays as juniors than sophomores, but they weren't a lot better, and Joe Jakubowski was probably more productive as a freshman than he was at a senior. And that makes me worry as a fan. It is a test of our program. Our guys have talent and ability, and I do think we have a good coaching staff. But, we finished behind teams who have that, too, and we need to pass them, and to do that, we need players to get better from year to year, not just older. After four years under our Coach, I think fans are expecting to see some real progress and that's not unreasonable at this point. I think we are getting near my review of the men's basketball season. Sometime came out of looking at the four factors and what role they played in BG winning that I thought was interesting. It has to do with getting to the free throw line...and it was something BG was not good at. 10th in FT Point %, 307th in D1. So, the picture is not good. BG simply didn't force teams to foul them, which resulted in BG getting fewer and making fewer free throws than almost everyone in our conference. And, for that matter, BG was among the worst teams in D1 at getting to the line and making free throws. This might not have been too bad if BG was a good FT team, but the Falcons were somewhat below average in that category too. BG wants to play inside out, and part of that is getting fouled near the basket and converting the free throws. Simply put, BG does not have the players who can create fouls in the paint...and that makes it more difficult to put up winning point totals...and when you don't shoot especially well and maybe turn the ball over a little...well, its tough to win like that. I'm guessing that if BG was fouled more, it would be in the place of 2FG attempts. Extending the logic, it stands to reason that on those possessions now we get inside and are guarded, and if we were harder to guard we'd he fouled on what would otherwise be decent shot attempts...in other words, tough shot attempts would be replaced by better FG attempts and more FTs...probably a few less turnovers too. So, as the team heads into the off-season, they are going to hve to figure out how to score more consistently. Most of that will be by shooting better...but, creating fouls would be a huge improvement. So, yesterday we went under the hood and look at the game stats that determined whether the Men's Hoops team won or lost...yesterday, we concluded that our very average offense gave us little margin for error, and cost us some games that were probably won based solely on defending....so today we delve into the offense to see what we can find. The team, for the year, scored only .96 points per possession, which is 9th in the MAC and 283rd in the nation. We had next to no margin for error. That's a low number to start with...and below .95 points per possession, BG was 0-13. BG's worst offensive performances that yielded to a win were @UB and @NIU...both .96 points per possession. On the plus side, BG had to get to 1.09 points per possession before significant wins came along...above that mark, BG was 8-1, but again, that's way above their average. The defense really only cost the team a game they should have won, and that was the game @UWM when BG scored 1.13 ppp and didn't get the win. What components are there behind scoring. Well, the first and most important part is shooting the ball. Using Effective FG%, we see that BG averaged 50.4% over the course of the season. When they shot over 55% they were 9-1, and when it was under 45% they were 0-10...which is remarkable only for its complete unremarkability. Offensive rebounding did not appear to play any real role in whether the team won or not. BG averaged 30.5% offensive rebounds, which is 8th/252nd. When BG was over 35% they were 3-5 and under 25% they were 3-6. So, shooting is clearly a critical component in points per possession. Turnovers is another one...at least on the negative side. BG turned the ball over on 20% of its possessions, which is a pretty typical number (6th/160th). BG already shot poorly, and a team that shoots poorly can't afford to turn the ball over (an automatic zero point possession). At a turnover rate over 22%, BG was 0-10. Sadly, the flip side isn't as good. Taking care of the ball didn't help very much, as BG was 6-4 when they were under 18% turnovers. Finally, free throws. I'll have a more specific post on this coming up, because it is the one thing about this year's team I didn't notice as much while it was happening. BG simply was not fouled. BG was the worst team in the MAC in getting free throw opportunities and one of the worst (319) in D1. For the year, the team average 3 FT attempts for every 10 FGAs....when that number is 4.5/10 FGA, BG was 5-1, but under 25, the Falcons were 2-10. I don't think you can avoid the conclusion that BG simply didn't have a strong mix of offensive playmakers. The team shot poorly for the year, and didn't have players who defenses were forced to foul. And, though the team took care of the ball OK, because of the above factors, when TOs were a problem, it was something the team couldn't shoot their way out of. More in coming days about what this means for the near-term future of our program. As part of my review of the Falcon basketball season, I wanted to look at some of the tempo-free stats and whether they led to a tendency to win or lose. A couple things here. First, there are two key elements. First, is the record, but second is how far away from the mean do you have to get before you see something extreme with records. If it is close to the mean, they that's pretty important...it means your team is having trouble in relatively common circumstances. If it is far from the mean, they it is an outlier and something you would expect to have a big impact on your record. For example, I wrote a lot about how BG had not won a game when it allowed 1.02 points per possession or more. BG finished the season at 1.0 points per possession and the national median was 1.01. The fact that BG was unable to win when they allowed even a little bit over their average means that the team's offense provided no margin for error. If BG did not get stops, their offense simply did not bail them out. BG was 0-12 when allowing over 1.02 PPP. You had to get down to .9 PPP before you start to see some semblance of being sure you would win, at 5-2. We will return to this theme. Now, points per possession is made up of a bunch of different things. One of them is getting teams to miss shots. In fact, studies have shown that this is true--and it seems obvious that it would be. We use the Effective FG%, which counts 3-FG as 1.5 when doing the math, to reward teams for taking the risk of shooting a 3. BG allowed 50.8% as an average. Nationally, the media was 48.8%, so the Falcons were slightly below average on this measure, probably due to weak 3-defense . When BG allowed EFG% of 54% or above, they were 1-10 on the season. I'm not sure this is quite as surprising...certainly we needed to defend the shot better well to have a shot at winning, but I don't know how many teams win giving up over 54%. Perhaps the more alarming stat is that it happened 11 times. As opposed to the mirror image on the plus side....BG held teams under 46% only 7 times, and lost 3 of those games. Now, when you get a team to miss, you have to get the rebound to end the possession. Any Falcon fan would be able to tell you that the team struggled mightily in some games in protecting the offensive boards. For the season, BG was at 33% which is the neighborhood of the typical national average. However, go up to 35% allowed, which isn't very far, and the team is 2-11. So, you have a team that struggled a little getting misses, and then a team that doesn't get the misses that do occur, and you're going to have a a hard time winning those games. On the plus side you have to go down to 28% to see an impact, and even then, BG was only 7-3. The other scoring factor is free throws. I believe this was a serious part of our offensive issues, but on defense, BG again was right on the national average. Using the FT formula (FTA/FGA), we see that BG allowed a rate of 38, which means for every 100 FG attempts we allowed 38 FT attempts. The national average is 37.6. On defense this simply doesn't appear to be much of a factor. If you go all the way up to a FT Rate of 57, BG is 1-6, but you'd expect that, and when BG's opponents were below 20, the Falcons were 6-2, and I suspect you'd find that most times, too. There is one thing you can do, of course, when faced with these shooting and rebounding issues...stop a shot from happening at all by getting turnovers. For the part of the season where BG was thriving, this seemed to be the key element. Nationally, 1 in 5 possessions ends in a turnover. BG created turnovers on 23% of its defensive possessions. This clearly impacted winning. At just 24%, BG was 8-3. The key conclusion, to me, is that BG did not have the horsepower to stay with people who were shooting well. We had to defend the thought. Also, though, if you look at the results above, you can see that there were a few occasions when BG wasted a victory-caliber defensive performance, but very rare that offense bailed the defense out. (If ever). So, we talked a lot about how our team was young this year. The chart above is from statsheet.com. What he does is take each player and multiply their minutes played by their year in school. So, Freshmen are x1, Sophomores x2, Juniors x3, Seniors x4. So, you get a measure of experience based on playing time, which I think is a pretty good way to go about it. It doesn't tell everything--Calhoun would be a Sophomore (2x) even though he is only playing for the first year. Anyhoo. As you can see, BG was not the youngest team in the MAC--or even close. Even if you throw out the Rockets, who were unnaturally young due to the need to completely re-boot the program, there were still 3 younger teams in the MAC and each of them ended up with better records than the Falcons had. We were almost exactly as experienced as WMU and they beat us twice. On the other hand, BG was 1-1 against OU and beat Ball State. Still, Ball State and WMU were both top 4 seeds, and they were younger than BG. Now, when we look at the more experienced teams, we see NIU, EMU, and CMU, three of the 45 worst teams in D1, RPI-wise. So its not about experience, per se. The key is to have good players who are experienced. The worst player will eventually become a senior. 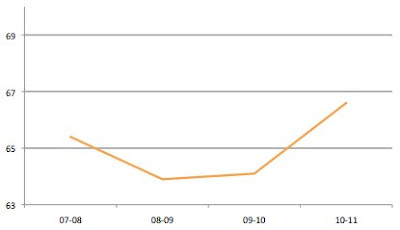 My observation--without any actual data--is that the MAC has more high quality FR and SO then it has in a long time. My point is that BG is not going to compete just by getting more experienced. That will help, but other teams that are already ahead of us will gain just as much if not more. We have to get more experienced and have our players continue to grow. We can't assume we will compete next year just because we only lost one guy. When looking through our men's hoop statistics, I did find us highly ranked nationally in one category--percentage of points that came on 2FG's. We led the MAC and were third in the nation with over 62%. This is not a huge surprise....we like to play inside out, and certainly you had to notice that we did not get to the line or make 3s in any huge numbers. 7 of the 14 had winning records. 6 of the 14 had losing records. 2 of the teams made the NCAA Tournament, and one (UNC) was a high seed. Others (UIC, Iowa and Manhattan) were really bad in their conference. At least 2 of these teams fired their coach. So, I started to analyze whether any of these teams were able to combine 2FGs% with 3s or FTs and become something other than one-dimensional, until I realized you just aren't very likely to see that. If you score 60%+ in one category, you're going to get some 3s and some FTs just as a matter of course, and therefore, you're unlikely to have 60% 2FG, 10% 3FG and 30% FTs. They are going to be pretty evenly split between 3FG and FTs. Finally, I would surmise that a couple of the most successful teams were making their 2FGs in transition and not in half-court sets. Now, add in Coach Orr's inside-out philosophy. The idea is that you are supposed to be able to get inside, get fouled or kick it out. So, you might actually find that to truly run an inside-out offense, you don't want numbers quite this high. I will look later at BG's inability to draw fouls and what role that might have played in our offensive issues. The All-State Basketball teams are out. BG Signee Jehvon Clarke was 2nd team All-State, so congratulations to him. And Chauncey Orr, Coach Orr's son, was first team All-State. Congrats to him as well. Lost in the Big Dance hype (and what a weekend it was), we now take a second to check how MAC teams are doing out in the wilderness of the minor post-season tournaments. And the answer is, not too shabby. Kent has reached the quarterfinals of the NIT. They went to Cali and beat St. Mary and then went out east and beat Fairfield. I know this is the NIT, but this is a nice run for these guys. They play @Colorado tomorrow night at 9, in what should be a good game. A win would be very nice for the conference, especially as Colorado was The Official Aggrieved Party of the 2011 NCAA Tourney. Buffalo and OU are still alive in the Collegeinsider.com tournament, which is for mid-majors only. OU won their first game in the Collegeinsider.com tournament, beating Marshall. 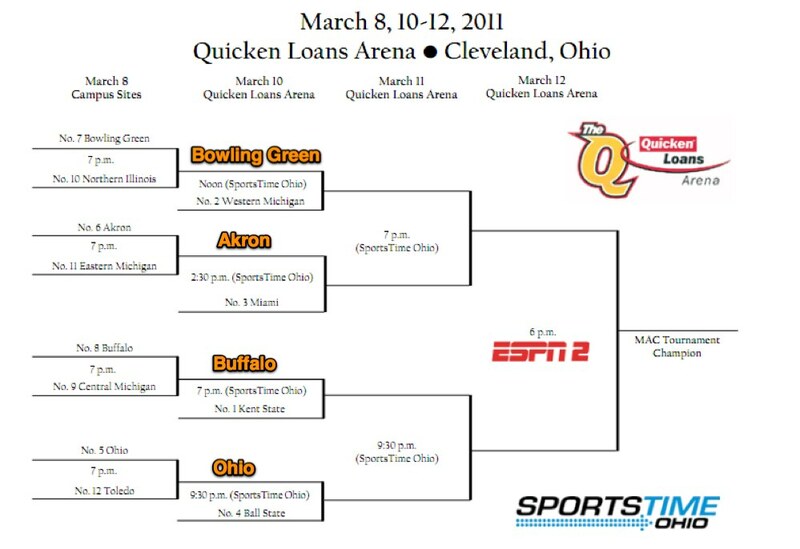 Buffalo won @Quinnipiac and @WMU to make the quarterfinals. 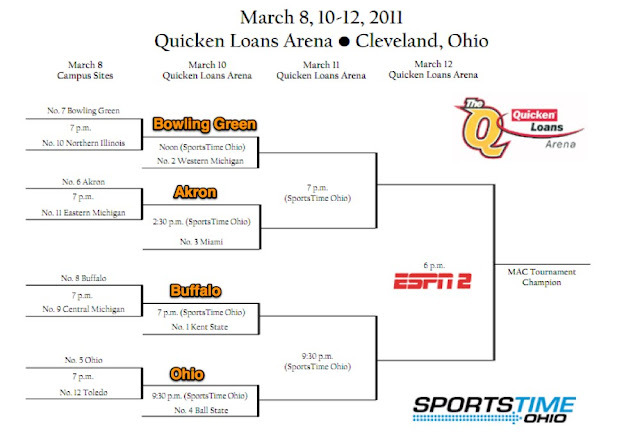 OU plays @East Tennessee State and Buffalo plays @Iona tomorrow night in quarterfinal play. 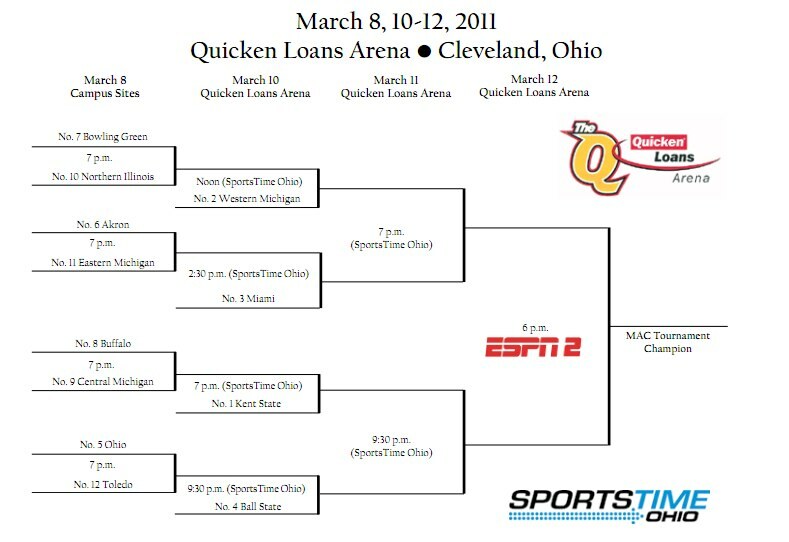 (OU only needed one game to make the quarters due to the bracket they use). The Buffalo-Iona game will be interesting for a certain announcer from the NCAA tournament, who insisted several times during the Akron-Notre Dame game that Akron had beaten Iona to win the MAC/MAAC Championship. I'd like to think he'll see that and feel foolish, but I have no high hopes. To close the loop, Miami qualified for the CBI and lost @Rhode Island in the first round. First, Timken had a great year, going 19-3 and losing in the District Semis. They won their 4th straight league title. They were led by Conference Player of the Year Jehvon Clarke, who is one of our signees. Get this: during his four years on the team, including 3 years as a starter, Clarke never lost a conference game. He averaged 17 points a game this year to go with 4.7 assists, 3.0 steals and 4.3 rebounds. He was also named all-district. A 6'1" guard, he would appear to be well positioned to be an impact player in the MAC. The other Timken recruit is Desmond Rorie, a 6'9" C. On paper, he is a little harder to read. He just didn't generate huge numbers as a Sr. in Canton. But, there are reasons why he is signed to play D1 ball. First, he is long and athletic with a huge wingspan. He blocked six shots in this game and was honorable mention all-conference. EPSN ranks Clarke an 84 and Rorie and 80--that's because Rorie has big upside potential to be a force in the middle of a defense. The most common word used to describe him, besides upside, is project. One of the things we talked about in the pre-season was that our team was now a 100% Orr creation, and that our team was going to be able to run a little bit and pick the pace up...get some easy baskets, etc. I wanted to go back and see if our tempo changed significantly from previous years which was very slow. In fact, our pace was up about 4%. Probably not as much as we might have hoped, but it was up. We had hoped to play some man defense, too. Anyway, as you can see, we were up about 2.5 possessions per game. I checked our conference rank, too, just to make sure we didn't move up as the entire MAC did, but we moved from the bottom of the conference to the middle. This number could have been a little higher. I think we did try to run the ball up after baskets and off rebounds, but we lacked the playmakers to do anything in the transition, which meant we just lapsed into our half court offense, and then ran the shot clock down, and for this tempo measure, that's pretty much the same as just walking it up. Anyway, the conclusion is that we did increase our tempo a little bit this year, compared to the previous years. I don't think anyone expected us to be up-tempo and they were right. OK, Kids. The second installment of Take Your Medicine goes back to our November game-by-game predictions. This is an annual exercise in humility that does not disappoint this year. I picked 19 games right and 11 wrong, which, frankly, is not really too humbling given the wild swings this team had. Obviously, I had some trouble early on, but I did not expect that we would lose to Howard or to Niagara and Albany on a neutral floor, and I think we shouldn't have lost those games to this day. You can't be wronger than I was in the Duquesne game. Meanwhile, I thought we would lose @St. L, Miami, OU and Ball State, and we did not. On the other hand, I thought we would beat WMU, Akron and Kent at home, and we in fact, did not. On balance, I thought we would go 16-14 and 8-8 not counting the bracket buster, and we went 13-17 and 8-8 in comparable games. So I saw us 3 games better than we were for the season and right on for the MAC, though with some variations on how you get there. The football team has started spring practice at the Doyt, and Coach Clawson met with the media after the first practice. 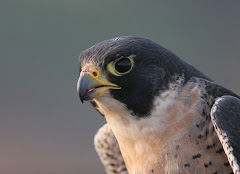 You can go to bgsufalcons.com to see the full video as well as a photo gallery. As always, I have listened so you don't have to. First, everyone should know what we are trying to accomplish. This is the 3rd season in the system, so people should definitely know what the system is. Also, and this is incredible, but there are only two teams in the MAC with more time in their system. So, there's no excuse for being new anymore. Second, Coach is excited about the internal competition, which is something he has talked about a lot. He said that some jobs were more or less given out in the past, but with talented depth at every position, practices should improve. And, even if for example, Chris Jones remained the #1, it would help the team a great deal if he only had to play 50 snaps. He is excited about LB. Gabe Martin and DJ Lynch give depth after being injured last year. Having only 2 QBs as opposed to the 4 we were working out last Spring is also a big advantage. You aren't wasting reps on somebody who is not going to play. He says both Hurley and Schilz have high upsides. You can't talk Falcon football without talking about the offensive line. Ben Bojicic had surgery and will have no contact this Spring. The 3 juco guys are on in camp and have improved the depth already. We have a full two-deep on the line which we did not have last year. Chip Robinson is taking snaps at center. Also out for the spring are Ronnie Goble, Jarius Campbell and Zak Akenberger. There have been no major position changes. Notre Dame eventually overpowered Akron today, winning by 13 points in the end. Akron was only down 4 at the half and 5 with 11 minutes left in the game, but the Zips never got that close again. They entered as a #15 seed, the lowest seed since the 2007 RedHawks, and therefore got a tough assignment, a Notre Dame team that had a shot at getting a #1. It was a credible performance under difficult circumstances. Akron shot only 35%--Zeke Marshall was 2-13, McNees 3-9, McKnight 3-12--and Notre Dame dominated them in terms of getting those missed shots, holding Akron to under 20% offensive rebounding. Quincy Diggs had 11, no other Zip was in double figures. So, just to catalog it, since the Kent run to the Elite Eight in 2002, when Sweet 16 runs were fairly common for the MAC, the conference is 2-8, with CMU getting one win and OU getting one (last season). So, with the men's basketball season over, I wanted to take a look at how our opponents did for the season. I've listed their final record, RPI, and where they finished in their conference, along with post-season play. For the second straight year, BG's top out of conference win was over St. Louis. This one was on the road, but their RPI is not really very good. Of course, the win over TX-San Antonio also looks nice, given their victory in the PIG last night in Dayton. Beyond that, there was a win over a sad FIU program and a Manhattan team that fired their coach at the end of the season. In total, based on RPI, BG's top win was over Miami. The worst out of conference loss for BG was the first...losing to Howard is just never going to look good. They were a terrible team, one of the 20 worst in the NCAA. In any other year, losing to Niagara and Youngstown State would also suffice as pretty bad, especially Niagara on a neutral court. Five of these teams got into post-season play...MSU, UM and UTSA in the NCAA, Milwaukee in the NIT and Duquesne in the CBI. Obviously, there were some tough games on this schedule, but a number of winnable ones, too. As the season ends, I wanted to just take a quick second and look at where the program stands today, both in terms of our conference peers and our own historical record. Despite this year's January and February, the program is, in a larger context, in the midst of a pretty serious downswing. There has been chatter here and there that we need to make a change in the leadership of the program, which I do not subscribe to, though I do understand. I understand it because this is the 4th year of Coach Orr's tenure at BG, and, with the exception of a regular season MAC title won mostly with players from the Dakich regime, it has been more of the same. In fact, BG was 13-17/7-9 in Orr's first year, and 14-19/8-8 this year. I think everyone thought there would be some adjustment from Dakich to Orr, and things were pretty weak when Dakich left, but in basketball, you'd like to think in four years you'd see more progress than this. I do understand those sentiments. Let's understand what we have....post-West Virginia, BG has had losing seasons 7 out of last 9 years. BG has made only one trip to semi finals since 2001-2, and none to final. Other than Coach Orr's second season, BG has not been seeded about #7 for the tourney during that period, and has not a winning record on the road in any of those season. So, it also isn't entirely about Coach Orr. It is about a general lack of success over nearly a decade's worth of time. People are impatient for success, and I can understand that. We went from a program good enough to vault Dakich into the Big East to a program with 7 losing seasons in 9 years. I do think, however, that there is talent coming up in our program. I like our young players, I like our incoming recruits, and I like our new facility. Even with all that, it will be far from easy. Kent and Akron are consistently good. Akron adds transfers in next year who were sitting out this year. Kent only loses Rod Sherman off this year's team. In fact, BG talked about its youth, but there were 4 teams in the MAC less experienced than we were--UT, WMU, OU and Ball State--and three of those teams finished ahead of us in the standings. We have to be better than those teams are and just getting a year's more experience isn't going to do it. I think Coach Orr is a good coach with a proven track record, and I believe he can succeed here and I believe that the pieces are in place. Whether it happens or not remains to be seen--but, in a way, so does everything in life. Being a BG Men's Basketball fan continues to bring me a lot of pleasure, and I'll be at the Stroh Center in the Fall, one way or the other. So, in the wee hours of the night, Eastern time, Kent picked up a pretty nice win for the MAC in the NIT. They were playing on the road against a pretty good St. Mary's team that could easily have been in the tournament, and trailing by 11 with 10 minutes left in the game and 6 points with 2:20 left to play. The play by play shows that in the last 2 minutes, Kent made 5 layups including a Justin Greene layup with :03 left to ice the game, while getting a couple of stops along the way. This is a nice win for Kent and the MAC. St. Mary's was an 11 point favorite based on the Vegas line, which was probably a really good bet if you compare the teams based on the available numbers. Or, a really good bet based on Kent winning the game. Porrini had 19 points and 7 assists, Holt had 13 points, 6 rebounds and 6 assists and Guyton had 13 points and 6 rebounds. Greene redeemed a pretty average night (13 points, 4 rebounds and 7 turnovers) with the winning layup with :03 left. We shared this one with the media who also liked OU. Really, there was no way to see anything different happening, giving who they had back. Still, they played more like the 9th place team they were in the regular season than the MAC Tourney and Big Dance team...and that was largely Armon Bassett. Taking some props for this one. The media picked them 4th, but I saw that they had some very good players returning and, of course, the evil genius. The media had them second. I didn't think Kent was going to be able to take all those new guys and win the conference again, which was obviously wrong. Porrini and Manns both exceeded what I thought they would contribute. More to come on our season review. Obviously, I had some orange-colored glasses on. The media picked us 5th. With only two players back and a bunch of transfers awaiting arrival next season, I didn't see Akron being as good as they ended up being--of course, especially not making the tournament. They got solid production out of 7-8 guys, good point play from Alex Abreu, and Steve McNees seemed like a more completely player. Buffalo finished in a tie with BG at 8-8 and lost the tie-breaker. They were also picked 6th by the MAC Media. They lost a ton of players from last year, and the fact they did this well is due to a smart decision on Mulkey, the emergence of Zach Filzen, and FOTY Javon McCrea. Media picked them first, too. I liked the job Taylor is doing, as well as Jesse Barry. 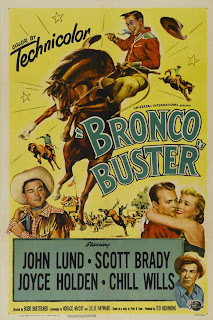 They probably did about what anyone thought, and the bigger surprise was Western. Media also had these guys 2nd. They had won this division the past couple years, and I figured they would contend. Yeah, not so much. Ernie Ziegler certainly has yet to show he is a good coach--beyond being the Father of Trey--and to say they were 3rd in the West is a little bit of an overstatement. They were among the 45 worst teams, RPI-wise. 3. Eastern Michigan (Actual Finish: Tied for Fourth). I always think EMU will finally turn it around. Media had them 3rd, too. They were dreadful. Media had them fourth, too. They lost 3 of their top 4 scorers, and I didn't see them having the year they had. It was a fine coaching job by Steve Hawkins. 5. Northern Illinois (Actual Finish: Tied for 4th). I don't see the Patton era in NIU ending well. Nailed it. While the Media had it right in total, the Huskies got 2 first place votes. You get no credit for predicting this one. They were even a little worse than I thought they would be. Having said that, don't look for it to last. Yes, indeed, that is correct. 50% of the Mid-American conference men's basketball teams are in post-season play....in fact, the only team that would have been appropriate that is not in post-season play is Ball State, and their Coach said it was because they didn't want to pay to play. That's interesting, given that the MAC is 20th in average RPI, behind even the Atlantic Sun and the Southern Conference. Depending on how you look at it, it is possible we are not that bad. While there is no outstanding team in the MAC, there are a lot of bad ones bringing the average down. The very worst conferences (MEAC, SWAC, Great West) have 5 or 6--not as many more as you would hope. So, looking at the conference as a whole, you could make a case that the league first 6 are a lot more competitive than the bottom 4. Kent@St. Mary's (if both teams feel like playing, this could be good). As for the streak of BG's last NCAA appearance, it continues now to 43 years. Until very late on Saturday, it looked like Harvard could get in....but we dodged a bullet on a miracle Princeton victory. In fact, no one slipped by us this year. The list is actually one shorter, however, starting next year. Centenary has taken itself off the list, not by making the tournament, but by giving up the chase. They are leaving D1 forever. This means that their drought will remain frozen at 50 years, like a fly in amber. Falcon women are champs again! jwagnerblade: #BGSU women's hoops: FINAL FROM THE Q: BG 51, EMU 46. So, at some point in the basketball season I declared a moratorium on football posts while I focused on what was emerging as a truly enjoyable basketball season. And while that didn't end the way any of us hoped, it was still a special season, punctuated by the last 2 wins at Anderson. Some stray football new did pile up, and I catch up on it now. 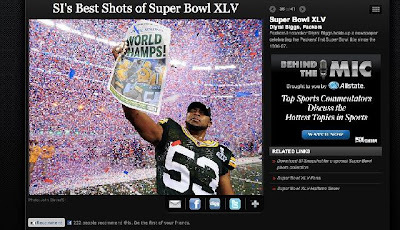 First, Diryal Briggs played on the Super Bowl Champion Green Bay Packers. As you can see above, SI took a nice shot of him that ended up being featured on their website. Diryal came back for the Kent game and received a nice welcome from the Falcon fans. It was exciting and nice to see him back. He has really persevered...he was undrafted, was cut a couple times, and then ended up playing in the Super Bowl. Second, following recruiting day there were some additional reports of "preferred walk ons" coming to BG. These were ably tracked in John Wagner's column in The Blade, here for the bulk of them and here for our new punter. Of most interest is Brian Schmeidebusch, a punter who last played at the University of Findlay in 2009. He will be eligible to play this Fall, and the Falcons need a punter. He averaged 42 yards per punt for the Oilers and 11 of his 38 punts were inside the 20 (a lot of punts inside the 20 can impact your average as you intentionally kick it short). He was a second-team DII All-American. Among the broader list of preferred walk ons, we have already written about Matt Redfield, a LB from Columbus, and Malik Stokes a prep-school QB who is making the transition to WR. You should check out Wagner's link. These preferred walk ons are a highly decorated group of players, many of whom were outstanding players at smaller schools in our area. There are a number of all-district and all-state players. The Falcons made use of a number of walk-ons this year, and, if nothing else, having guys like this around keep the pressure on the scholarship guys--internal competition. On the less positive note, we have some departures. Kellen Pagel (as we have written already) is heading to UMASS, and Nick Tuminello (TE) is heading to Youngstown State. DB Lane Robilotto (played in a couple games). QB Caleb Watkins (hit by numbers game, much like Pagel). Coach had hinted we would seem some attrition, and we did. Football is tough. You don't lose your contributors, because they are playing and stay. You lose guys who might or might not have contributed in the future. I think we are continuing to recruit well, so quality of players hopefully will not be an issue. However, program depth has been an issue, and these losses could impact that. We noted our D-Line coach moved to Vanderbilt. He was replaced with a guy I think was a good hire. He is Larry McDaniel, who coached the D-Line at Kent for 8 seasons. Last year, Kent had a killer defensive line, including Roosevelt Nix, who became the first freshman to be the MAC's defensive player of the year. Kyle at Mlive.com did some nice recruiting analysis. (Kyle is in our MAC Blogger Roundtable). First, he looked at which teams got the most players who had other offers. (All caveats on shadowy recruiting services and the reliability of their rankings are restated). No. 1 Toledo -- The Rockets are on top (again) as their top 10 players accumulated a total of 54 offers, or 5.4 average offers per recruit. No. 2 Bowling Green -- The Falcons are very strong with 52 offers and a 5.2 average. No. 3 Ohio -- The Bobcats had a plethora of nice recruits in 2011. Their top 10 players generated 37 offers. There are 9 other teams. I don't list them because I just wanted to show the drop off between BG at #2 and OU at #3. CMU and Miami were last at 1.9 offers per recruits. It is only the start of the story, but to me, it is a huge thing to be getting recruits everybody else wants. A story appears to be emerging that would have Tim Beckman and Dave Clawson as the best two recruiters in the MAC, which could lead to some very interesting games in the future. Recruiting is just the first step. The other analysis Kyle did was to look at the number of recruits each team got that didn't have another D1 offer. Here are the bottom 3 (or the best 3) on this measure. No. 11 Tim Beckman at Toledo -- Every recruiting site, from ESPN to Scout.com, has been in total agreement that the Rockets have the best recruiting class in the MAC. You might be surprised to learn that only 30 percent of their class went unloved by other programs. No. 12 Dave Clawson at Bowling Green -- Clawson has destroyed the majority of MAC coaches who have tried to compete with him for recruits. Despite a down season in 2010, Clawson was able to bring in the consensus No. 2 recruiting class in the MAC. Only 6 of his 24 players (25 percent) had no options outside of Bowling Green. No. 13 Bill Cubit at Western Michigan -- Nobody closes a recruiting season faster or harder than WMU coach Bill Cubit. Going into January, Cubit traditionally has only a handful of recruits committed. By Signing Day, his stocking is loaded with more BCS caliber recruits than any other team in the MAC. Only a measly 20 percent of his players are headed to Kalamazoo because they had nowhere else to go. Top-to-bottom, this is the best class in the MAC based on the average demand of each recruit. Just a few quick notes. There will be a long time--months in fact--to recap a season that gave me a lot of enjoyment and pleasure. I find that my love of college basketball grows stronger each year, and I truly enjoyed this year. College basketball in a one-bid conference is an exciting challenge every single night. Today, WMU was simply too much for BG...again. They won this one by 11, but it was never legitimately close at any time that mattered. The only time the game was closer than 9 points was early in the second half. For the remainder of the half, WMU led by at least that much and into the mid-teens at times. Things got tough right off the bat as Calhoun picked up two fouls about :30 apart around 15 minutes, and then BG broke with their normal practice of sitting him until the second half and he came back in with about 9 left and had this third foul about a minute later. From there, Western just slowly moved the game away and kept it there. BG does deserve credit for competing credibly with them on the boards, but WMU scored 1.11 points per possession and BG scored at .93 points per possession, and neither one of those numbers is in the area where you can win. As you can see on the chart below, WMU had a huge +8 advantage in FT shooting, although many of those came at the end. They had a modest shooting advantage--BG was actually better on 2FGS, but awful (1-12) from 3 while WMU was 6 of 16. Finally, WMU took great care of the ball, turning it over only 8 times while BG turned it over 13 times, in itself not a terrible number, but giving 5 extra possessions to a team that you are having trouble stopping is not helpful. Individually speaking, Dee Brown had 17 points and McElroy had 15, though they mostly game in the garbage time at the end. Calhoun played only 23 minutes and had 10/5 in that period. Crawford and Thomas both struggled badly with their shots, and that contributed to those low offensive efficiency numbers. So, for the second straight season, the last face BG seems is Steve Hawkins. Certainly, a run from here on in would have been really exciting, but WMU clearly established in their two games against BG who the stronger team is. As I said, more to come in the weeks ahead. A thanks to everyone involved in our basketball program for a good year. It always makes me happy. The MAC Quarterfinals loom at noon today, and BG will be facing the Western Michigan Broncos, a team which has, by and large, represented a trail of tears for the orange and brown over the past few years. In fact, the Broncos won 12 of the last 13 between the two teams, including knocking BG from the MAC tournament last season. The two teams did play earlier this year, and Western won the game at Anderson by 14. The first few minutes were close, but by the 9 minute mark WMU was up 8 and they led by 16 at halftime. The Falcons did battle back and get the game within 5 with about 3 minutes left, but a free throw and a putback got WMU back up 8 and that was all she wrote. Rebounds and free throws got the win for WMU. They rebounded 50% of their misses on the offensive end, just a crazy number, and they also got to the line 17 times, making 16 of those. The other elements of the game were pretty close. Juwan Howard Jr (all-freshman) had 20 points and 10 rebounds and Demetrius Ward had 15. Their PG, Mike Douglas, had 5 assists. For BG, A'uston Calhoun had 23 and 7, Scott Thomas had 15 and McElroy had 12. Western is 19-11 to date and 11-5 in the MAC. Now, that included some easy games against NIU, EMU and UT, and they even lost to UT, but they also won 3 cross over games (@Miami, @BG, OU) against the West. They have won 8 of their last 9 games. This is a very good offensive basketball team. (MAC games only). They are the second most efficient offensive team in the conference (1.08 points per possession), 4th in FG%, 3rd in 3%, 5th in EFG% and 3rd in free throw % and free throws made. However, they lead the conference in offensive rebound percentage, which helps to make them as efficient as they are. On the downsides, they do turn the ball over a little, and they are only 7th in making 3s. BG has keyed its last two wins on defense. This is going to have to be an every possession defensive effort at the Q. BG will especially need to improve its performance on the offensive glass. On the plus side, WMU is largely an inside team, which matches BG's style a little better. (They did make 9 3s out of 20 in the first meeting, it should be noted). WMU is a solid defensive team, 6th in the MAC at 1.01 points per possession. They are 4th in EFG% allowed, 5th in FG% allowed and 4th in 3FG allowed. They are as tough on the defensive glass as they are on the offensive glass, but are 10th in getting turnovers. This is a winnable game. WMU had a good conference season against some weak competiton, but they did beat BG handily in Anderson. On the other hand, this blog has noted BG's jekyl and hyde performances this year, and this team is certainly capable of being a very tough out on a neutral court if they defend well, rebound, and then hit some shots on the other end. I'm really looking forward to seeing how it goes and if BG can break whatever whammy the Broncos have on them. So, the MAC award season came to an end today with the announcement of the all-MAC team and All-Freshman team. Let's look. As for the first team, I guess you can't really argue about any of these. Clearly, I live in my own little world as it relates to Brandon Bowdry, so I will just leave it there. With that objection registered, those are all very good players and deserving of the honor. As for the second team, I might have put Porrini over Mulkey, but again, it is hard to argue with those players. I wouldn't argue for Thomas or Calhoun from BG to make the 2nd team. Calhoun would be closer, but was not consistent enough. 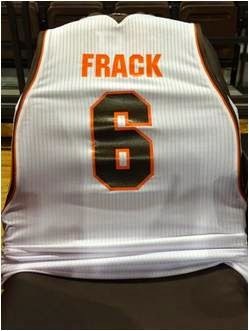 He is, however, an excellent candidate for the pre-season team and next year...he is truly becoming a dominant player. In what really was the last men's basketball game at Anderson Arena, the Falcons won a comfortable victory over the NIU Huskies, which they really should have. If you're going to compete in tourney basketball, you need to be playing well. NIU was a poor team with Xavier Silas, and without him, they should be beatable on your home floor by any team that purports to be a MAC title contender. And that's what happened. The first half was tight, with BG sinking a 3 to take a 2 point lead into the locker room. Things got better in the second half....BG shot 57% in the 2nd half, was 5-9 from beyond the arc and made only 2 turnovers, while to 32% shooting, 1 of 6 from beyond the arc and 10 turnovers. BG outscored NIU 40-22 in the second half for the 74-54 win. It was BG's biggest win of the season in D1 competition. It was also tied for its best points per possession on both offense and defense in D1 competition. Again, this was a short-handed NIU team that wasn't very good to start with. But, we have played down to teams in the past, especially during our run through the West, so it was nice to see us beat a team like we did last night. As you can see, shooting and turnovers were the primary difference. BG took excellent care of the ball and was very efficient when it did get a shot up. There was not much offensive rebounding either way, and the game was blissful for the lack of fouls. It took 15 minutes less than a normal game. A'uston Calhoun had a dominant game for BG, scoring 25 points and adding 9 rebounds. He shot 12 of 18 from the field, which is good even for an inside guy. He torched the Huskies inside. Scott Thomas had 12 points including 3 of 5 from the field, and he added 9 assists on top of that, as NIU was running out to cover him. He had 5 steals, too. Dee Brown had 10 points and Jordan Crawford had 9. One other note: little used Wiley Roberts, who has been the team manager for 3 seasons and was added this year to the active roster, was able to get into the game. The team ran some plays for him, and after a couple of misses he drained a 3 with 29 seconds left, to an explosion of cheers from the home crowd and jubilation on the home bench. It was his first collegiate basket. Further, he will now go down in history as the last Falcon to score in Anderson Arena. Coach Stone talked about his unselfish contribution to the team--despite his lack of playing time--and I'm going to suggest that Anderson Arena, humble and workmanlike, would find him to be a fitting player to close its scoring with. So, it is on to Cleveland for a game with Western Michigan, a team which has been beating us lately, but who we have the ability to match up with. They have a good MAC record, but they also got it through six games with EMU, UT and NIU. On a neutral floor, I'd like to think we have a shot at competing with them. The Falcons closed out their home arena with two wins....tonight's win a game when they did what they should have done to a poor and weak team on our floor---beat them by 20 for the team's biggest D1 win of the season. More on the victory tomorrow. Meanwhile, the bracket is below. Note that the first four teams out are all from the West. The MAC Awards for Freshmen, 6th Man and Defensive player of the year came out today. I give the MAC media credit. While I stated yesterday that they decided Greene would win before the season started and that they would do the same with Trey Zeigler as Freshman of the Year, they did, in fact, give the award to the more deserving player, Javon McCrea of Buffalo. Good for them. (Vote was 10-9). Often wrong, never in doubt is our motto. The 6th man award went to Carlton Guyton of Kent. I can't argue with that. The whole award is artificial to me, because sometimes guys start but play less that the reserve, in effect making the bench player the more important. I just think it is hard to gauge an actual sixth man. Having said that, Guyton is a good player who would be starting most places in the MAC. Finally, Michael Porrini of Kent was named the defensive player of the year. He's a really, really good player. The MAC announced the first two awards of award week today. The Coach of the year was Geno Ford, which is how I would have voted. He has now won back-back regular season titles, and he did it this year with an almost entirely new team from last year. That, to me, is a pretty good coaching job. I can't argue with Coles, he's always strong and Hawkins would have bee a reasonable vote, too. I do differ a little on the player of the year. I would contend to you that Justin Greene won this award before the season even began. Not that he isn't a good player, as are Mavunga and Cooper. But the MAC Player of the Year was Brandon Bowdry. 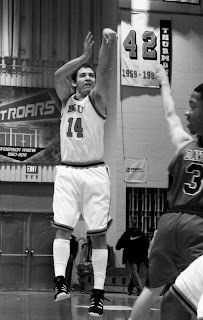 Second in the MAC in scoring, leading in rebounds, he was simply the most outstanding player in the league this year. I know he played for a terrible team--so much the more difficult for him to do what he did. He should have won this award. Good bye to Anderson Arena...this time we mean it! So, by virtue of winning Saturday, the Falcons will get to play one more game in Anderson Arena. With a win, they can make it back to the Q and line up with WMU. The MAC is wide open, and if you get hot now, who knows what will happen. The opponent is NIU. BG played NIU during the "snow event" in February. BG went over a day early, spent way more time than anyone should in DeKalb, and then came out pretty flat (in front of an announced crowd of 465) against a Huskie team that was down 3 regulars due to injury and flu. NIU tied it with a 3 with :17 left, and BG could not get a good shot on our end to win. Then, Silas missed an in-and-out 3 that would have tied it at the end of OT to preserve BG's win. BG was able to win by shooting just slightly better than NIU and creating some turnovers....on most measures, the under-manned Huskies, well, took the measure of BG. Neither team had a point per possession. It was one of those, ugly, grinding wins. It has been a long year in DeKalb. They are 9-20 and 5-11 in the MAC. They beat EMU and UT twice each, and have only one win that is not against one of those teams---they did beat Akron, which BG did not. Their RPI is 315 out of 345. There is a lot of talk that their Coach will be sent packing after the season, and their best player, Xavier Silas, is injured and will not play against BGSU, according to a Monday teleconference comment from their coach. This is not nothing. Silas is their own double figure scorer, and is the leading scorer in the MAC in conference games and 8th in the nation. It doesn't get any better beyond that. Nate Rucker, their 3rd leading scorer, is questionable, and Bryan Hall, their assists leader, is reported to be out. Coach's son Michael Patton also has achilles tendon issues. I can remember some years under DD with all the injuries, just limping home. So, you'd like to think BG could win this one. But, strange things happen at tournament time, and the first game went into OT. It has to be won. Tim Toler (who had the flu the first time BG played NIU) is picking up some slack for NIU. He had 17 and 10 in the regular season finale against Ball State. Tony Nixon added 11. Despite a good game on the offensive boards, NIU was beaten in other categories. It is hard to look at stats too much, because this is such a different group of players than the ones NIU had when most of the numbers were generated. If BG comes out with the energy it had on Saturday (tough to do, I know), this is a game they should win, especially with the injuries. I'd like to think that we would be highly favored even up, but with their injury issues, we should be able to win this game. It was a story that needed a happy ending. And it had one....Bowling Green came up with the kind of game that they had in the first part of the MAC season, combining good defense with rebounding and an ability to close the game....and they won the game by 10. It was one of their better performances of the MAC season, if not the best. And, it came at the right time, both emotionally and in terms of giving the team a shot at the Q. BG earned a home berth against NIU Tuesday, and if that game can be won, would play WMU Thursday at noon. It is a crazy year in the MAC, and I know its unlikely, but this team is capable of winning those two games. BG scored 1.14 points per possession, which is tied with the OU for our second best game of the year. At the same time, BG played very strong defense, holding UB to .98 points per possession. That spells a very comfortable victory for the Falcons. With about 8 minutes left, BG was up 17-16. BG put together a very nice run until halftime, outscoring UB 20-8 in those last 8 minutes, punctuated by a wicked dunk by A'uston Calhoun off a well-designed set play to end the half. Coming out in the second half, BG was up 13, and that lead held nicely in the second half. UB was unable to crack a 10 point margin and with 6:36 left the Falcons led by 17 points. Buffalo made a little run to get it to 7 with about 2:30 left. Here was one of the game's critical moments. BG has struggled lately in moments like this, and did, in fact, struggle against UB the first time around. BG was running clock, and the shot clock was inside 10 and Crawford had the ball way out top. Things can go two ways here. If we don't score and give up a run-out and the Bulls hit a transition hoop, and the lead is down to 5 (or 4), things can completely change. But things went another way. Crawford beat his man, got into the paint and sunk a jumper in traffic against the best shot blocking team in the conference. BG was up 9 and it was a free throw contest. The Falcons then sunk 7 of 8 FTs down the stretch (yeah, I looked it up!---Crawford 1 and Brown with 6) and the game was never again in doubt. In fact, the old' Buzzer Banger called off the dogs down the stretch, and the last minute was played to bone chilling excitement from a nostalgic and appreciative home crowd. In terms of stats, it boiled down to basic matters of basketball. Coming in, Buffalo had a 7% advantage in effective field goal %. In the game, BG was +5 in EFG%, which means a 12% swing and that would help a bunch of teams win. Also, Buffalo is usually a very good 3-FG shooting team, hitting 38%. Yesterday, they hit 20%, and BG actually had more 3s than their opponent. This is where the team has struggled. We were OK when we were getting stops through turnovers, but teams seem to be getting wise to that, and we need to defend the shot to get stops. And get the rebound. Buffalo had an OK game with 34% on the offensive boards, but that is an average figure and indicates that BG at least held its own in this category. BG was very good, on the other hand, on its own offensive boards, with 42% of the offensive boards, the Falcon's second best game of the year. And free throws. In the end, BG ended up 14 of 19 from the line, a +8 advantage over Buffalo, who was 6-12. As we know, BG hit the last 7 of the last 8, so before that we were 7 of 11, but it was great to see us ice the game. Dee Brown is the wrong man to foul late in the game. Speaking of which, Dee Brown had 21 points in the game, to go with 3 assists. It was the second time in MAC play he has gotten over 20 and he did it on 6-13 shooting and 8 FTs, netting an offensive efficiency of 146. He was joined by A'uston Calhoun, who was an absolute beast with 16 points and 14 rebounds. Jordan Crawford added 13 points. And so before generations of Falcon players, Bowling Green answered the call yesterday. From here, the focus can switch to the MAC tourney, and seeing if the Falcons can make a run into the finals at the Q.
Freddie Falcon Makes Dramatic Entrance!! Had a great day at Anderson today...certainly had some sad thoughts while waiting for the game to start, but once it did, the Falcons and the University put on a great show for us. The ceremony was certainly moving and appropriate. A big hand to everyone involved. Proud to be a Falcon and proud to have been in Anderson today. 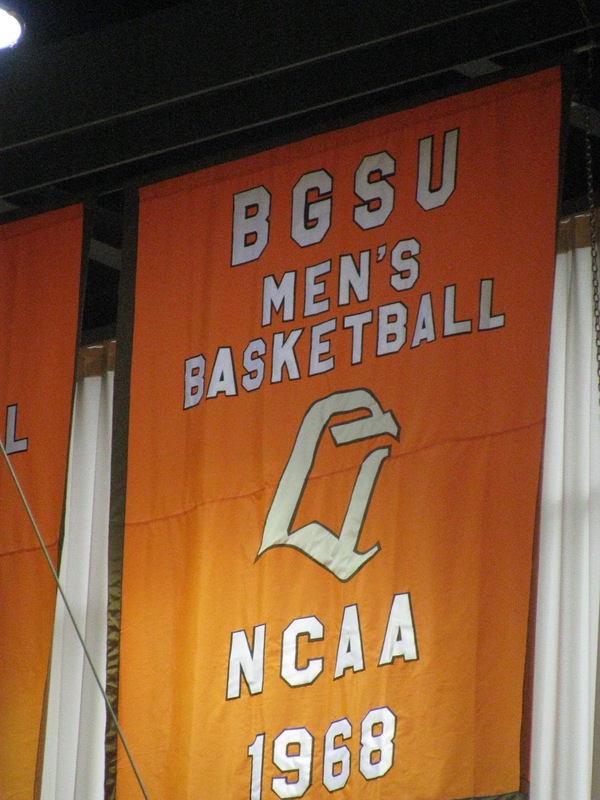 So, there's a game happening tomorrow, and it is a game that, for BG, will determine whether the Falcons get a home game in the MAC tourney or have to play at CMU. Although they don't expect to sell-out, I think they are expecting a good crowd, and a raucous crowd would be very helpful to our cause. 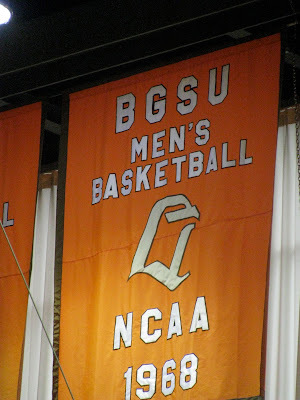 BG did, in fact, beat Buffalo when they opened MAC play together in Alumni Hall. It was actually a pretty good game for the Falcons. BG beat Buffalo in all facets of the game, won by defending the shot and not with turnovers, rebounded effectively, failing only to close the game out by allowing Buffalo to score in the last 3 seconds of both regulation and the first overtime before the Falcons won in the second overtime. Buffalo was held scoreless for the last 3:54 of the 2nd overtime. Winning in double OT on the road is pretty tough....be interesting to know how often it has happened in D1 hoops this year. A'uston Calhoun had 20 points and 9 rebounds, and Scott Thomas had 19 points and 11 rebounds. Cam Black added 11 rebounds. (Remember, this was a 50 minute game). Since then, the Bulls have played very well. They are 17-11 and one game ahead of BG in the standings, and they have an RPI in the 150 range. In fact, given what has been seen from them this year, it has to be pretty disappointing to the Bulls to not be doing better. They have lost 5 of their last 8, including a thumping of CMU and a bracket buster win over Milwaukee but also losses to EMU and OU. They are 2-5 on the road in the MAC. Early on, their big story was Byron Mulkey, the player they red-shirted after his junior year so that they would have a senior on this year's team. Mulkey is not producing like he did early in the year...he has been out of double figures in his last two games and four of the last eight. This has coincided with the strong play of Zach Filzen, who has been in double figures for his last 12 games. Filzen is a 6'3" JR guard. Just as impressively, they have all-Freshman lock Javon McCrea, who leads the conference (in MAC games) in FG% and is the conference's 10th most efficiency offensive player. He's 6'9" and averages 11 points and 6 rebounds per game. (Unrelated to anything, I would argue that McCrea is the MAC's true Freshman of the year, ahead of the ballyhooed Trey Zeigler. Check this out to see why. Meantime, we will see if the powers that be agree, which I doubt). Buffalo is 4th in the MAC in offensive efficiency (conference games only), and this is only because they have a tendency to turn the ball over and are only average in getting to the line and in making free throws. They are second in FG%, 3FG%, Offensive Rebound%....this is a very good offensive team. They are playing a much slower pace than they did in the past, and are only 9th in possessions, despite some overtimes. They are also solid on defense, if not spectacular. Here, they seem to actually be better than their numbers. They are 8th in FG% allowed, 6th in 3FG% allowed, and 11th in allowing free throws, but they are very good on the defensive boards and lead the conference in forcing turnovers. They lead the MAC (by a lot) in blocked shot. The output of all this is that they are 5th in defensive efficiency. I don't know. Looking at all this, they should be better than grappling for the last home game. Still, it all comes down to the one game. Here's hoping that the big crowd and the occasion bring out the best in the Falcons and they play the way they are capable of and get the win on what is a special day for us. BG only has one senior who has been with the program, and that is Joe Jakubowski. Joe was one of the first recruits that Coach Orr found....he had signed to play at Rice, but there was a coaching change there and he decided to come back to NWO and play prior to enrolling in Houston. Here's what I wrote when we learned he was coming. I don't think people have a full perspective on what we have with him. A couple notes. He arrived to a program that was utterly bereft of point guards and had been since Brandon Pardon had left. Let us recall names like Jabari Mattox, Moon Robinson, John Floyd when we realize that we just had not had strong point guard play in a long time. We were easy to pressure and made a lot of turnovers. Joe settled that down right from the beginning. He has certainly had a disappointing senior season, and I think that is making people forget that he was a pretty good player for the previous seasons. Was he better than Antonio Daniels, David Greer or Brandon Pardon? Probably not. Rosie Barnes or Brian Miller? Closer. Also, he had some very important games for the Falcons. Here are a few of the highlights. 8 assists against OU in MAC quarterfinal in Coach Orr's only win at the Q. Thanks, from the Falcon Nation to Joe Jakubowski. He gave his entire effort, had some great games, was a consistent contributor to our program, and is a quality student and citizen. We are proud that you were a Falcon.